(NaturalNews) The cancer industry is a for-profit industry that relies on repeat business to keep padding its bottom line. David Bowie and Alan Rickman are just two of the industry's latest victims, but there will sadly be millions more. Anyone who thinks the cancer industry would ever research and release an actual cancer "cure" is delusional... there's no chance that a multi-billion-dollar industry will deliberately make itself obsolete and obliterate its entire business model. The entire cancer industry is based on pure scientific fraud. Out of 53 "landmark" studies cited by the cancer industry to push chemotherapy and other toxic treatments, 88 percent were found to be completely fabricated. Similarly, a recent study conducted at the Fred Hutchinson Cancer Research Center in Seattle, Washington found that tumors grow FASTER after chemotherapy treatments, meaning chemo accelerates tumor growth and spreads the cancer. Maybe that why 9 out of 10 oncologists would refuse chemotherapy themselves because they know how incredibly toxic it is. Like any for-profit industry, the cancer industry needs more cancer patients, year after year, to stay profitable and powerful. That's why it actively withholds information from cancer patients that could prevent and even reverse cancer in many cases. Fundraising for "the cure" doesn't fund any real cures at all. Instead, most of the funds are used to pay for free mammogram screening in low-income (i.e. black) communities where women and men are scared into a cancer diagnoses that generates massive profits for oncologists, drug companies and medical equipment manufacturers. 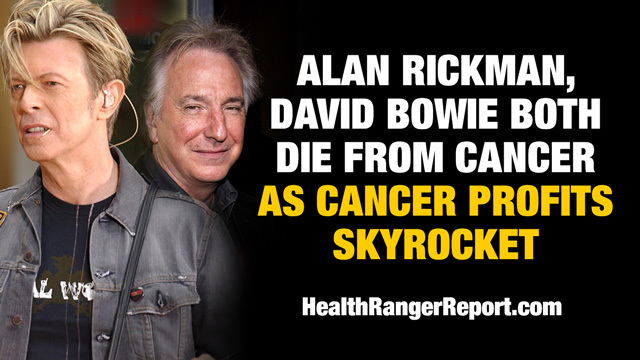 When people like David Bowie and Alan Rickman die from cancer, it's because the cancer industry withheld livesaving information from them about cancer prevention, anti-cancer foods, vitamin D supplementation, avoidance of toxic chemicals and other crucial information that can save lives. Not only is the cancer industry in the business of profiting from suffering and disease, it's also the key suppression authority of natural solutions against cancer such as anti-cancer medicinal mushrooms (reishi, shiitake, maitake, etc. ), the anti-cancer potential of vitamin D and alternative cancer therapies that have been banned in the United States purely for political reasons (see the relentless attacks on Gerson Therapy or Dr. Burzynski to learn more). Click here for my full podcast about David Bowie and Alan Rickman.